Can I change the battery on my Polar device? Battery life time depends highly on how much you use the device.Can I charge my Polar device with another kind of USB cable or via a wall outlet?Your Polar device (Loop, Loop 2, M430, M600, V800, Vantage M, Vantage V) can be charged via computer only with the custom USB cable that came in the box.My M400 is not charging Make sure that M400 charging area is dry Open the USB port cover and rinse the USB port with lukewarm water after each training session.What is the battery lifetime and operational time of my M400?The battery operating time in continuous training with GPS recording and heart rate is up to 8 hours. Polar Running Program Training for an event, and want to know how, how much and how often you should train? Whethe...The what and how of Running Index Polar Smart Coaching features If you’re looking to keep on top of your running performance you’ll find this feature a big help.Polar Flow Season PlannerWith Polar Flow Season Planner you can plan and customize the training season you want.What if the Polar Fitness Test does not work out? If your wrist unit does not succeed to receive your heart rate at the beginning or during the test, the test will fail (Test Failed on the display).The what and how of Polar Fitness test What is Fitness Test? The Polar Fitness Test is an easy, safe and quick way to estimate your aerobic (cardiovascular) fitness at rest.OwnCal Polar training computers with the OwnCal feature display the cumulative energy expenditure (in kil...Fat Burning Percentage This feature calculates an estimate of calories expended from fat during a workout and it is expressed as a percentage of the total calories burned.What is Assisted GPS (A-GPS)? How does it work?The Polar devices listed in the 'Related products' section below use Assisted GPS (A-GPS) to acquire a fast satellite fix.Training Benefit featurePolar Running Program FAQs What is the Polar Running Program based on? It is based on training in the right heart rate zone, and the science behind the Polar Heart Rate Zones is the cornerstone of the program.The what and how of Training Load Training load is textual feedback on the strenuousness of a single training session.The what and how of Recovery Status What is Recovery Status? The Recovery Status feature estimates how much training load you can tolerate.The what and how of speed and pace zones What are speed and pace zones? Speed and pace zones are a new way of guiding the efficiency of your training during sessions.Smart Notifications (iOS)The smart notifications feature allows you to get alerts about incoming calls, messages and notifications from apps onto your Polar device.Smart Notifications (Android)​The smart notifications feature allows you to get alerts about incoming calls, messages and notifications from apps onto your Polar device. Troubleshooting GPSMake sure GPS recording is set on: M400/M430: On your Polar device, go to Settings > Sport Profiles, choose the sport and set GPS recording on.What is Assisted GPS (A-GPS)? How does it work?The Polar devices listed in the 'Related products' section below use Assisted GPS (A-GPS) to acquire a fast satellite fix. Abnormal Heart Rate Readings During Exercise 1. Heart rate view during exercise (HR / HR%) If your training computer constantly displays too...Heart rate based trainingYour heart rate data gives you an insight into your physical condition and helps you understand how your body responds to training. Water resistance of Polar productsMost Polar products can be worn when swimming. They are not, however, diving instruments. To maintai...Maintenance of your M400Like any electronic device, the Polar M400 should be kept clean and treated with care.Why does the display of my Polar training device fog up? Don’t worry if the display of your Polar training device fogs up. How to manage your privacy in Polar FlowIn the Polar Flow service, you can adjust your privacy settings for three different instances: your Profile, your Sessions and your Activity summaries.How can I edit sport profiles in Polar Flow?The sport profiles feature lets you list all your favorite sports and define specific settings for each one of them.How do I export individual training sessions from Polar Flow web service?You can choose either to export your training file as a GPX, TCX or CSV file, or to zip the files for faster download.How can I change my email address in Polar Flow web service?You can change your e-mail address in Polar Account or in flow.How do I reset my Polar M460/M450/M400/A300/V800? Soft reset You can do a soft reset by pressing and holding the UP, DOWN, BACK and LIGHT buttons simultaneously for five seconds until the Polar animation is shown on the display.Languages in My Polar DeviceYour Polar device is delivered with English only, but you can add other languages from the Flow web service.Is my M400 compatible with earlier Polar software and services?M400 is not compatible with Polar ProTrainer 5 software or the polarpersonaltrainer.M400 memory storage and notificationsM400 has a 4 MB memory. It can store up to 30 hours of training with GPS and heart rate, depending o...Can I use other Polar products at the same time? 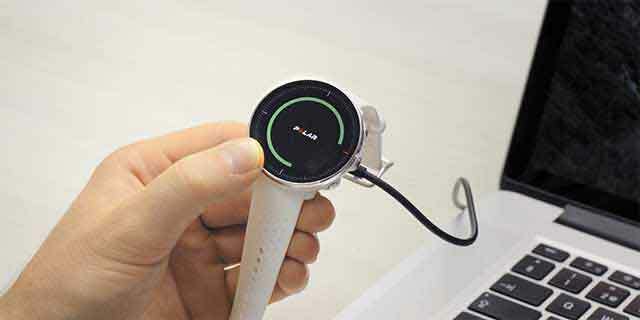 Polar Beat app Your Polar device is compatible with Polar Flow app, it cannot be used with Polar Beat app. Water resistance of Polar productsMost Polar products can be worn when swimming. They are not, however, diving instruments. 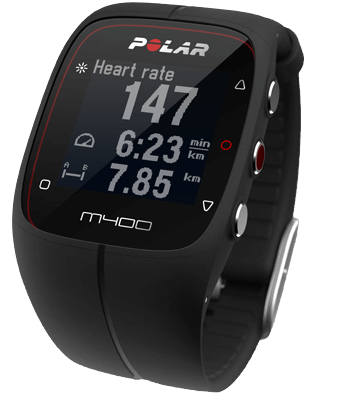 To maintai...Swimming with Polar Loop, Polar Loop 2 and M400?Polar Loop, Polar Loop 2 and M400 are water resistant and good for tracking activity when you swim, but they can't record heart rate in water. How do I sync my Polar Device with the Polar Flow app?Before syncing make sure: You have a Polar account and the Flow app downloaded and installed t...I’ve made changes in the Polar Flow web service/app, but I can’t see them on my Polar deviceIf you change settings, create or update sport profiles, create training targets or add favorites in the Polar Flow web service or Polar Flow app, you need to sync the changes to your Polar device.Troubleshooting Polar FlowSyncIf you have problems using Polar FlowSync, please check the following troubleshooting tips.Syncing data between Polar device and Polar Flow app failsPlease notice that the sync may take a while if you have lots of activity and training data on your Polar device.Polar M400 sync does not start in FlowSync. Now what? Check that the M400 charging area is clean If your M400 doesn’t charge properly, or if ...Troubleshooting M400 synchronization Syncing data between Polar M400 and Polar Flow app fails.How do I sync my Polar device with Flow service?You can transfer data from your Polar device via USB cable or wirelessly via Bluetooth Smart with the Polar Flow app.